Dr. Bhanot received Bachelor in Physiotherapy from India in 2004. He completed Master of Science in Kinesiology (Major: Biomechanics) from University of Nevada, Las Vegas in 2007. He then worked as a physical therapist in Michigan from 2008 to 2013. During this time, he worked in a hospital-based outpatient facility. There his case load was mainly orthopedic and sports rehabilitation, but he also got experience in adult neurological rehabilitation and wound care. Dr. Bhanot completed his PhD in Orthopedics and Sports in 2013 from Rocky Mountain University of Health Professions, Provo, UT while working full time as a physical therapist in Michigan. His dissertation focused on identifying EMG activity for the hip and trunk muscles during the Star Excursion Balance Test. After finishing his PhD in 2013, Dr. Bhanot joined the University of St. Augustine for Health Sciences (USA) as an Assistant professor. He completed manual therapy certification in 2013 followed by dry needling certification in 2016. He also became the fellow of the American Academy of Orthopedic Manual Physical Therapists in 2017. 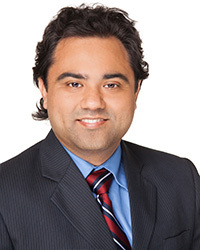 Dr. Bhanot’s research interests are to investigate the effects of manual therapy specifically myofascial techniques on low back pain and neck pain. He is also interested in investigating the role of spinal stabilization exercises on lower extremity injuries. Dr. Bhanot’s teaching responsibilities are Biomechanics, Soft Tissue Intervention II, and Musculoskeletal IV: Clinical Reasoning. He lives in Austin with his wife Dr. Navpreet Kaur, son Ayaan and daughter Alya. He enjoys eating variety of ethnic foods and then burns it off by running 5k’s.